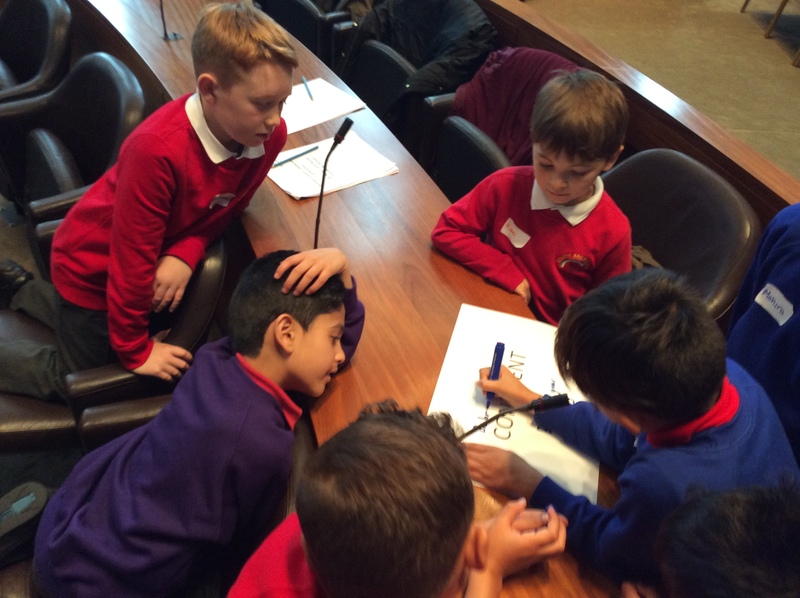 Led by the Integrated Youth Service which is part of Oldham Council, the Oldham Schools Linking Programme started in 2001 and is a great success, now linking 71 primary school classes across the authority, engaging an amazing 2250 pupils. The Schools Linking Network is also a key partner to the new Oldham Pledge Initiative in Oldham, ensuring that opportunities are develop key character traits for children and young people’s future. “The Schools Linking Network reinforces our Vision and Mission statement and underpins our school motto of ‘Working Together’’. Through our effective school link our staff and pupils engage with and learn about other Oldham children, with different cultures, beliefs, lives and experiences. This knowledge and understanding of differences and similarities fully prepares our pupils for life in modern Britain and encourages them to be citizens of the World”. Case study: St Hilda’s CE Primary and South Failsworth Primary School. The Link between the two schools has been in existence for more than 10 years and is an integral part of the school diary, school ethos and core offered to pupils from both schools. Although only 5 miles apart, the schools and the communities they serve are very different. Their participation and commitment to the Linking project brings them together. Over the years the schools have linked in various forms; Class swaps, joint school visits and trips, shared cultural visits to different places of worship, school council visits to the Mayor’s parlour, council chambers, magistrates court and citizenship ceremonies, leadership conferences for pupils, teacher exchanges and joint CPD opportunities – even joint Governor training. The Link has now been refined into a model which sees intense partnership working with Y2 classes over the entire year; visiting each other’s schools and local communities and taking part in lessons learning together. This is then developed through sharing and responding to cultural theatrical performances together (M6Theatre), as well as visiting local amenities for outdoor learning opportunities, such as the Castleshaw Centre and Alexandra Park. Running parallel to this aspect of the Link is the work of the school council/Pupil Parliament. This involves children of all ages from 6-11 who have been elected to be the pupil voice representatives from both schools. Early in the year they begin a project developing their leadership skills, which is facilitated by Suzy, the Local Authority Lead. 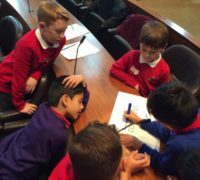 The children work firstly on identifying and developing key leadership qualities, and then put their skills to the test by working collaboratively on an enterprise project, such as costing and designing badges or T shirts. The children then take these new skills back to school to be further developed in their own setting or jointly on further projects. Every year South Failsworth School conducts an extended pupil survey in which a large sample of children from 4 – 11 years of age are asked their views and opinions on a range of issues. It is common for them to cite their experiences with children from St Hilda’s as a significant influence on their understanding of mutual respect, even if it has been a while since direct contact. Dedicating a hall display to our linking project every year and throughout the year, allows children and parents to reflect positively on the range of activities and the opportunities the Programme clearly offers for learning about our friends at St Hilda’s and their community. “Oldham has a history of segregation and perceived intolerance and cultural misunderstanding. 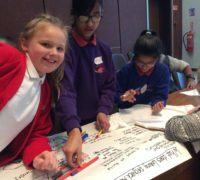 Participation in the school Linking Project demonstrates what is actually being done to bring communities together, with the youngest community members being educated to challenge and knowledgeably respond to these perceptions.” Head Teacher in Oldham. It is important that the Linking Project help children and young people develop key character traits to be well rounded and respectful citizens who can contribute to their community. These include confidence, caring, resilience, tolerant, respect, communication and neighbourly. We aim to empower children and young people to make their own decisions and choices and prepare them for their future. The Schools Linking Project is also a key partner to the new Oldham Pledge Initiative in Oldham ensuring that opportunities are develop key character traits for children and young people’s future. The Link between St Hilda’s CE Primary and South Failsworth Primary has been in existence for more than 10 years and is an integral part of the school diary, school ethos and core offer to pupils from both schools. Although only 5 miles apart the schools and the communities they serve are very different. Their participation and commitment to the Linking project brings them together. Over the years the schools have linked in various forms; Class swaps, joint school visits and trips, shared cultural visits to different places of worship, school council visits to Mayor’s parlour, council chambers, magistrates court and citizenship ceremonies (British Values) Leadership Conferences for pupils ,Teacher exchanges and joint CPD opportunities and even joint Governor training. Running parallel to this aspect of the Link is the work of the school council/Pupil Parliament. This involves children of all ages from 6-11 who have been elected to be the pupil voice representatives from both schools. Early in the year they begin a project developing their leadership skills which is facilitated by Suzy, the Local Authority Lead. 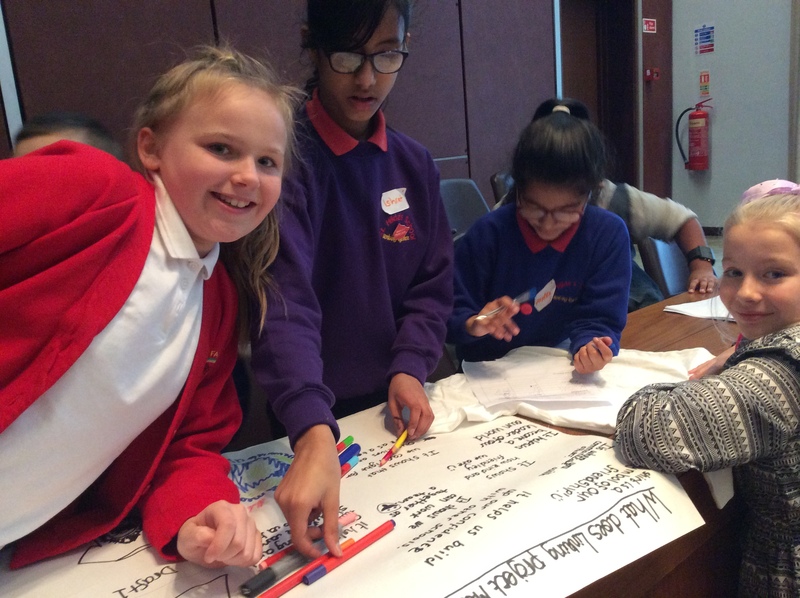 The children work firstly on identifying and developing the key leadership qualities: Resilience, Communication, Empathy, Organisation, Delegation, Courage, Time Management, and then put their skills to the test by working collaboratively on an enterprise project such as costing and designing badges or T shirts. The children then take these new skills back to school to be further developed in their own setting or jointly on further projects. Every year South Failsworth conduct an extended pupil survey in which a large sample of children from 4 – 11 years of age are asked their views and opinions on a range of issues. When they are asked about their relationships and treating everyone with respect it is common for them to cite their experiences with children from St Hilda’s as a significant influence on their understanding of mutual respect, even if it has been a significant time since direct contact. We update a designated hall display to our linking project every year and throughout the year, children and parents reflect positively on the range of activities that are offered and the opportunities it clearly offers for learning about our friends at St Hilda’s and the community they represent. We have had instances in the past of members of the community refusing or reluctantly engaging with our programme of events each year. That is an extremely rare occurrence now and reflects both the value the programme demonstrates and the opportunities to change hearts and minds in a sustained manner.